Recently there have been comparisons of the relative value of publicly accessible ‘front of house’ drug safety testing with ‘back of house’ lab-based testing only accessible to services working with people who use drugs. We suggest here that rather than competing models, we should aim for a gold standard testing system that includes both, in order to maximise public health benefits and minimise drug-related harm. 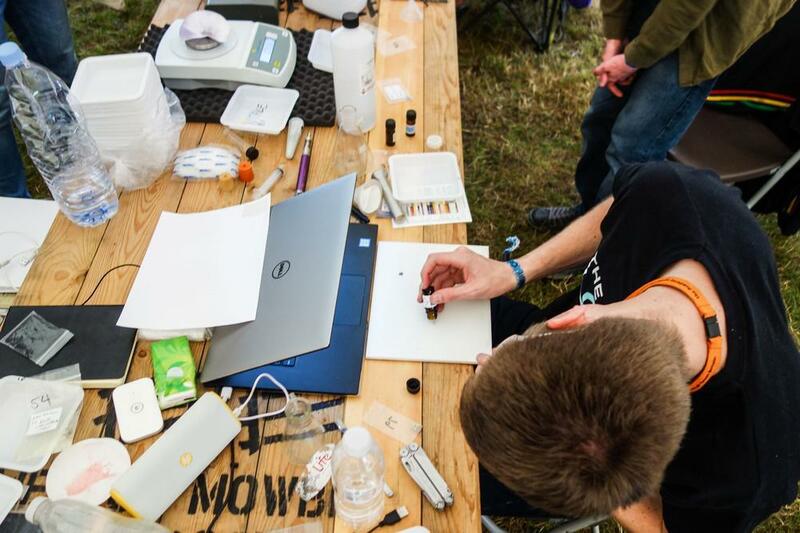 Along with the rapid rollout of ‘front of house’ drug safety testing in New Zealand last week, and at a number of UK festivals including Boomtown, a backlash has started. Criticism of the lack of full laboratory analysis and the communications limitations on site, as well as the old chestnut of the lack of scientific studies to prove its value, has been directed at front of house testing. Clearly it is not a silver bullet and indeed drug safety testing staff are probably more mindful than others of the limitations of their services but here at The Loop, we believe it can be a significant part of the jigsaw; a shift in focus and resources from criminal justice to public health. Here we focus on service delivery. Front of house testing, both on site at events and in fixed-lab-based settings, involves direct engagement with the public, with samples provided for a range of reasons (including to assess purity and dosage). At fixed-lab-based drug safety testing such as the Dutch DIMS system, members of the public can go at their leisure to get drugs tested at permanent city centre facilities and if necessary, wait several days for lab-based analysis. However research suggests that younger, more frequent, and male polydrug users are less likely to use such services. By contrast, at-event testing such as that conducted by The Loop in the UK and Energy Control in Spain, can capture the unplanned on-site purchase and consumption of drugs by these higher risk groups. Non-public back of house testing, such as various Early Warning Systems around Europe, involves samples being taken to private laboratories by the police, medical services and possibly drugs services in response to hospitalisations, deaths or other incidents. The general public does not have direct access to these services and there is no direct dissemination of results to individual users. By design these are reactive services, responding to problems in the illegal market. While test results may be strategically disseminated more widely, this will be selective, at the behest of the authorities and potentially delayed by hours or days depending on the circumstances and local political climate. And while some information may be passed on from individual ‘victims’ of these incidents, they may be reluctant to speak to the authorities who are necessarily involved. The recent story in Manchester where crystals of synthetic cannabinoid receptor agonists (known as SCRAs or ‘spice’) were sold as MDMA and caused ten hospitalisations, is a striking example of the value of a public testing service that could prevent accidental consumption of these substances in the first place. No ultra-sophisticated equipment is needed to detect such an event, even simple at-home reagent tests would have immediately alerted the victims to the fact that they were not consuming MDMA crystals in a way that trust or a visual inspection clearly couldn’t. There are many cases where a million pound lab isn’t the most important factor in reducing harm, but in fact, responsiveness, accessibility and effective information dissemination are more important. Currently the UK market is increasingly dominated by high purity MDMA, which is not something that a test result can “protect” against. In fact, the whole problem is that people don’t believe they need to protect themselves against this. However, it is well known that this isn’t the only thing that is being sold as MDMA and in ecstasy pills, so there is still a desire to access testing services. The Loop fully understands this, and we draw on the expertise of our chemists, criminologists and drugs workers to leverage people’s interest in their safety. Even in light of the current market, public testing is an incredibly valuable chance to engage all users, but especially those who may have purchased more impulsively. When a member of the public comes to hear the results of testing, they spend ten minutes discussing their usage with a trained drugs worker who is able to interpret their result and explain to them details like how it compares to what they expected the substance to be, what the risks are, and crucially, how to reduce those risks. As it is a private, one-on-one conversation with the veil of trust already broken, the opportunity for an open conversation is welcomed and allows for the delivery of targeted and useful drug information, without the need to tiptoe around the risk that information might cause someone to take drugs. The effect of the service is two-pronged, firstly there is the chance to dissuade drug use easily when something has been mis-sold, but also there is the opportunity to provide a service that non-public and at-home DIY testing cannot do, that even when the substance is as-expected, there is the chance to influence service users’ drug taking behaviour to reduce the possible harms. It is unlikely that front of house drug safety testing could ever match the sophistication of laboratory testing given the added physical challenges and time pressures, and consequently compromises involved in testing in a nightclub or festival environment, with an inevitable trade-off between speed, accuracy, portability and cost. However, recent and rapid technological advances mean that the gap between on-site and lab-based testing is likely to narrow further in future. The Loop currently uses FTIR and UV spectroscopy, reagent and other analytical methods, with Raman spectroscopy and portable GC-MS to be trialled on site later this year. However, what front of house testing can offer as a complement to back of house testing is a proactive rather than reactive service, and combining the rigour of a non-public system with this proactivity could be the gold standard that provides the most benefit to all stakeholders. Unlike back of house testing for police and public health only, front of house testing includes the public as a significant stakeholder in drug safety testing. Front of house testing offers an opportunity for users (and yes, even dealers) to come along before a substance has been consumed, to find out what is in their sample before it has done any damage, in a confidential and non judgemental setting. Crucially, talking with individual users and dealers is the only way to find out what these individuals thought they were buying or selling, a vital missing link in the chain in order to maximise the effectiveness of public health alerts and to know which users could be affected. And of course, this provides an opportunity to embed harm reduction and prevention messages in the realities of ever changing local drug markets, providing credible and informed drugs services on site at point of consumption, as well as wider dissemination via social media. So let’s work together to integrate, identify and inform. Guy Jones is a Senior Chemist and Volunteer Coordinator at The Loop, Director of Reagent Tests UK, Trustee of Kosmicaid and harm reduction specialist.